With KapaPlus, the company Pipetech, located in Ratingen, Germany, provides a software solution for project-oriented companies that is used for visualizing the resources' capacities for different decision levels and thus allows to schedule them. KapaPlus calculates the resources that are needed in a project and contrasts them with the base load and customer orders, selecting by project ideas, medium-term plannings and approved customer projects. Hence it is a rough calculation of resources that can be complemented with a detailed view if needed. With the help of a central project data base that can be quickly integrated into the IT landscape of the company, a very transparent overview of the state of data is created, keeping the responsible project and division managers informed and at the same time providing the business management that is used to more compact planning sheets with relevant data. 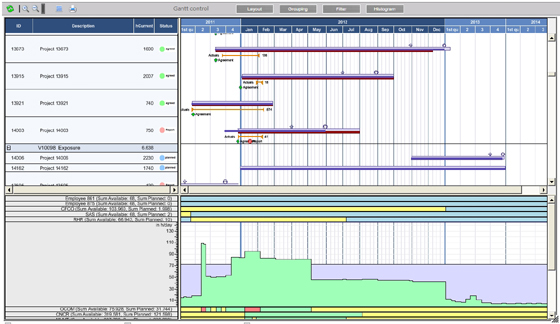 The planning's results are visualized in clearly-structured Gantt charts that Pipetech realizes by using VARCHART XGantt ASP .NET. Manfred Nutz, IT Consultant with Pipetech, gives reasons for the decision to use the NETRONIC component: "With NETRONIC's VARCHART XGantt ASP .NET we rely on a largely platform-neutral software component for the integration of professional project and resource planning functions in our application development. Due to the seamless integration of graphical planning and reporting functions in our sectoral and trade-specific data base applications, planning activities in the project workflow are being supported in an optimal way. Furthermore we are thrilled by the outlook of constantly enhancing this component by using the respective technologies."